Founded by Marie and Ted Glover in 2003 after adopting an injured cat, Tabby Town now provides shelter and care for up to 80 kittens and cats on any given day. Currently, the majority of their feline community is housed under the Glover’s roof, with two floors, multiple bedrooms, vertical lofts and a lovely sunroom. 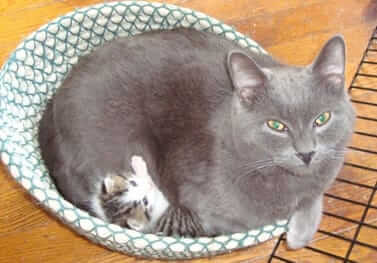 While most of their cats were abandoned, they’ve also saved kitties that were slated for euthanasia at local shelters. In the past six years, Marie and Ted have rescued 1,243 felines. As of this writing, they have successfully placed 1,053 in loving homes. In spite of the economic downturn and a dramatic spike in the number of rescued cats, Tabby Town USA has achieved a phenomenal placement rate – approaching 85%! The individuals responsible for the operation of Tabby Town shared a story with us that we believe illustrates a sense of their level of commitment to their cause. This year, they were presented with an enormous challenge: the mass rescue of 47 cats, many of whom required immediate and extensive medical treatment. These cats were barely surviving in deplorable conditions. In fact, some had already perished by the time Tabby Town came to the rescue. Every single feline that could be saved was saved. In our experience working to advance the cause of small rescues, the lengths to which Tabby Town went to handle this crisis event, perfectly demonstrate their above-and-beyond-the-call-of-duty attitude towards saving those unable to save themselves. In addition to bringing safety, relief and comfort to cats, arguably during the most desperate periods of their lives, this plucky organization founded The Thrifty Kitty, a resale store that markets donated clothing, household items, furniture and antiques. One hundred percent of the sales go to fund their rescue work. Further, Tabby Town regularly seeks donations from their local community through bake sales, cat care clinics, rummage sales, mail appeals … even a karaoke party! All of the proceeds from these fundraising activities go towards covering the superlative care they provide. The courageous and caring proprietors of Tabby Town USA are insistent upon making adoption affordable to their fellow Wisconsinites. In fact, the minimal fees they collect when cats transition to their forever homes don’t even cover the amount they pay for veterinary care and medical supplies. Were it not for their proactive fundraising and the receipt of generous donations like the one we’re announcing today, Tabby Town would be a ghost town. The financial award we provided will help to defray the costs of another ambitious Tabby Town plan to secure additional funds – an advertising campaign directed at 13,000 families who have already expressed interest in supporting feline rescue organizations. It is our sincere hope that this grant will enable Tabby Town to raise enough capital to continue their mission, to provide safe haven and a promising future for all of their cats. If you wish to send additional support to our foundation, you may do so when placing an order online or by sending a personal check to The Dr. Jane’s HealthyPetNet Foundation, Inc. at P.O. Box 1425, Palm City, FL 34991. Even if you can only spare a dollar or two, you’ll be providing much-needed aid to the organizations just like Tabby Town USA who work every day to reverse the trend of abandonment in America. Our sincere thanks to all of our readers who, through their personal donations and continued patronage, made this grant possible, to help the Glovers and their dedicated network of volunteers to continue their vital work to make the world a better place for abandoned felines. Through the years, we've had many folks write about our efforts here at Tabby Town, but no one has captured the essence of our compassion and determination like you have in this article. From the bottom of our hearts, thank you. GOD BLESS ALL YOUR GOOD WORKS! 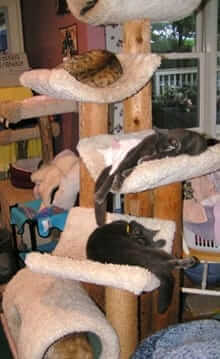 Love the picture of cats on scratching pole in Tabby Town. My 3 wouldn't be without ones inside the house and outside as well. All mine are rescued from different situations over the years. Most of my animals always have beeen rescue ones and mostly cats and for some strange reason Black cats more than any other colour! Keep up the good work.